At Stack Overflow the other day, I once again found myself trying to debunk a lot of the “revealed wisdom” in the SQL Server community. You can find the post here: Indexing a PK GUID in SQL Server 2012 to read the discussion. However, this post is not about GUID or sequential keys, which I have written about elsewhere, it is about cluster indexes and the love affair that SQL Server DBAs seem to have with them. It is interesting to note that both SQL Server and MySQL by default will create clustered primary keys on a table. On the other hand, you will find Oracle DBAs shake their heads in amazement as to why one would do such a thing. As with all “best practices” that are so widespread in the SQL Server community – the problem is that things typically a little more nuanced than the whitepapers would have you believe. And “it depends” is the worst cop-out ever. As you may have guessed, this post is about the advantages of heaps. But before we get there, let us first review the good reasons for using a clustered index on a table. If your table has a single index on a primary key, you probably want a cluster index. This is the default behaviour of SQL Server. But WHY is this so? In the clustered case, an insert will only touch the leaf row of the last page. 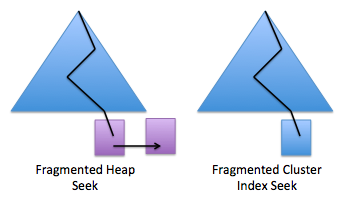 In the heap case, both the index and the heap has to be updated. This results in the heap needing one more logical read and one more write than the cluster. Clearly, the cluster index is to be preferred. For now, I just want to plant the idea in your mind that scalable tables are NOT sequentially laid out. I have blogged and presented extensively about this and Microsoft (Diagnosing and Resolving Latch Contention on SQL Server) even has it documented if you are the type of person who only take your wisdom from the corporation. We will get back to tables with one key very soon. Obviously, if you plan to range scan a table a lot on a key – this favours the cluster. Not only does this reduce I/O – it also reduces the amount of page lookups you have to do in memory. I have sometimes heard the revealed wisdom that clusters should also be used to support queries that have ORDER BY on the clustered key. There ARE cases where this is true and a the cluster index can help. But in my experience, these cases are very rare. It only takes a join to another tables and ordering on columns from that to completely break any ORDER BY benefits you gain from a cluster index. This then leads us to ask: What tables are likely to be range scanned in a database? Data Warehouses: Range scans on date columns in fact tables are common. Joining from a dimension table to the fact will also cause range scan of the surrogate key in the fact. Do note that of you need to range scan on date efficiently, it is often wise to use partitioning to optimise this. You may not have Enterprise Edition, in which case clustering on the date column is often a great idea. An argument can be made for clustering on the fact table surrogate key that is most frequently joined on. Ad 1) We can safely ignore any benefit from cluster indexes here. Small tables are, as the name implies, small. This means that scanning them is cheap no matter how silly our indexing is. For extremely frequently accessed tables, you should most likely be creating covering indexes to squeeze out the last performance. Cluster indexes don’t have any particular advantage here. Ad 2) When you join like this, you are typically range scanning. If you expect large result sets as an effect of this, clustering can be a great help. However, if you are generally expecting large result sets, you are either running ad-hoc reports, have poorly tuned access patterns or you are running a data warehouse. There is however an important exception to this rule: Tables where the typical query is nearly always seek on the primary key followed by a range scan of a few records in a table referencing that key where those records get created at the same time as the primary table. A good example of this is the Order/OrderLines paired table that exist in most sales systems. It makes good sense to cluster the OrderLines on OrderKey (and NOT on some IDENTITY column added to OrderLines) – because the join is frequent and nearly always results in a range scan of OrderLines that benefits from the order rows being close together. Also note that in this example, fragmentation isn’t massively affected by the key on Orders not being sequential. There is some inherent “packing” of OrderLines at INSERT time simply because the rows tend to arrive together in a single transaction (which means that any page splitting is minimal). Heaps have the great disadvantage of needing forward pointers when rows are deleted. Cluster indexes don’t suffer from this. For tables that see a lot of mixed deletes and inserts, forward pointers quickly waste space. They also doubles the cost of doing seeks: With a fragmented heap, you will now have to follow the forward pointer to find the final record, which adds an additional I/O. Tables that are in flux like this are great candidates for cluster indexes because you only pay the price to reach the bottom of the B-tree, not the price of chasing a forward pointer. Consider for a moment which tables these are. They see a lot of both deletes AND inserts. Are they therefore likely to be big? Perhaps, but tables typically get big because they see mostly INSERTS (transaction tables and fact tables being two classic examples). Lets keep this in mind. It should be clear that there are some good reasons to use the cluster index. But how common are the cluster scenarios really? Should the general rule be to use a clustered index? I don’t think there should be a general rule, because there are a lot of equally good reasons to use heaps. 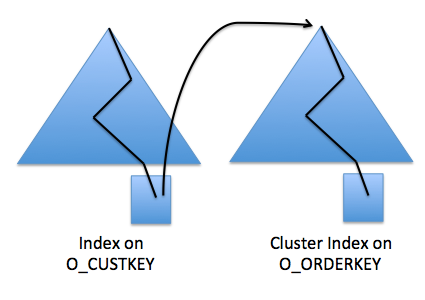 Consider what happens if the keys in the the single index in the cluster example are NOT sequential. In this case, a cluster index is going to get fragmented. These are the types of tables you care about at the heart of the business, they tend to make up the majority of your database size. It’s your bread and butter. 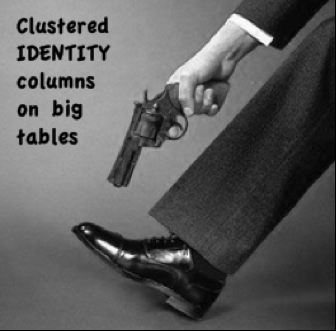 if you put a clustered IDENTITY INT/BIGINT column on those tables and declare that the key, you have just shot yourself in the foot! The IDENTITY column will make the INSERT activity un-scalable. And since this is one of your largest tables, you probably care quite a bit about that. What about GUID keys then, the thing everyone hates? Let’s say you did that, but kept the cluster index. Your table would now be massively fragmented. Not a problem in itself and it gets you around the scale bottlenecks. But you are wasting a lot of space. 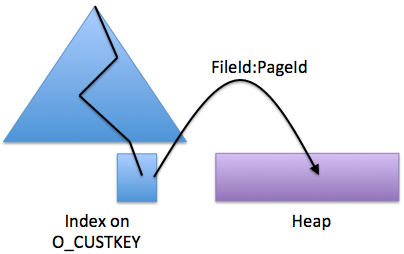 Consider the alternative: an indexing strategy where you pick a sufficiently “random” key (like a GUID) and instead of blindly declaring that key a cluster index, you instead leave the table as a heap and just put a good old fashioned unique, non-clustered key index on the GUID. The majority of the table growth from INSERTs now goes to the heap which will nicely fill up and stay un-fragmented. And that is a heck of lot more scalable than the last page insert problem (though not infinitely scalable, you need an additional trick for that). In the meantime, the index you care about remains small (it only contains the GUID, not the entire row at the leaf level) and is therefor MUCH more likely to fit in memory. Your seeks are now faster, and any fragmentation you get on the key is not going to consume as much space as if you had to fit the entire row into those leaf pages. Recall that I said that tables with only one index will often benefit from a cluster index. However, consider the scenario where you have multiple indexes that are frequently accessed. As an example, let us use the ORDERS table in TPC-H. This table is often accessed by customer, so it makes sense to add an index on O_CUSTKEY. The table also has a primary key index on O_ORDERKEY. So the heap is better, even on I/O. Why? Once the correct key has been located in the secondary index, you have to traverse the entire B-tree for the clustered index just to find the rest of the row. Because the index contains the RID of the row (which is the exact location in the data files) there is no need to climb any B-tree to find the rest of the row. Climbing B-trees is NOT free, there is a locking and memory access cost associated with it. By clustering the table, you are forcing every index except for the cluster to pay double the B-tree climb cost. Heap are better for this scenario. The final example in defence of the heap is tables that you typically want to scan (and that don’t fall into the frequent DELETE/INSERT category). In nearly all of the examples I have seen, these tables are fact tables in data warehouse or log files. With the exception of column store indexed tables (and soon, clustered column stores), you generally want these tables to be scanned and not seeked. In my data warehousing course, I describe the challenges of indexing fact tables. The short version is that when you get a seek of a fact table, even with a good index supporting it, it spells trouble. Seeks destroy sequential I/O on perfectly laid out table. They are also expensive because B-tree walking costs a lot of CPU. As if that wasn’t be enough, seek heavy plans on data warehouses can cause the execution engine to consume a lot of memory when index intersection plans are generated. Unfortunately, the SQL Server optimiser will often pick a seek over a scan – because it under estimates the speed that a modern I/O system can achieve when properly tuned for sequential access. Fast track is a good example of this; it is not uncommon to see sequential scan speed exceeding 10GB/sec. Sometimes, bad statistics cause the seek too, and bad statistics are difficult to avoid in a large data warehouse. Because of these issue with the optimiser, it is often desirable to completely take away the option of picking a seek. This means leaving the table as an un-indexed heap or a column store index. One way to think about a column store is that it is just a heap that is optimised for fast scans. You can consider partitioning the heap or column store to give the table a coarse grained “index” that reduces the amount of data that must be scanned – this is often better than clustering. As a data warehouse practitioner, I agree with all of your technical points. My experience on the OLTP end is way less; so, I can neither agree nor disagree with your points. The day may come, however, where I will need to reference this. As such….so be it bookmarked. An American who trusts neither Fox News nor CNN and believes his country is no more or less than a bunch of C students who saw an opportunity, ran with it, and now must reassess itself…..and the A thru F students it has created…..along with all the good and bad it has left behind. What a tough job that must be….. The first paragraph is repeated five times for some reason… not sure what would cause that. The whole article minus the first paragraph is also repeated five times. Hope this helps. Thanks JNM. I uninstalled my translation plug in and this seems to have messed up the blog a lot. Have not had time to clean up until now, will gradually fix this. although this blog post is an older one I really appreciate this article because I think the same way like you. There are to many myth around the “Clustered Index” on a small contiguous attribute around the world. I ALWAYS state in my sessions that the decision is based on the requirements and the analyzed workloads. “forward pointers when rows are deleted”! I only know forward pointers from UPDATES if the record doesn’t fit on the same page. Was the eventually a mistake in your post? Can you clarify this issue by a short script / explanation? “And “it depends” is the worst cop-out ever.” — And yet, this paper is 7 cases of “it depends”. By the way… There is also a white paper from Microsoft (sorry for not supplying the link, though) that tests both scenarios extensively for different operations and different table sizes and apart from one case the result invariably is: USE A CLUSTER because it’s faster than a heap. If I happen to find the paper, I’ll come back and give you the link. If in doubt – use science and test it yourself Darek. Authority means nothing. I’ve been developing a SQL-Server developer since the earliest versions of Sql-Server. I happened to stumble on this post, and I have a few problems with it. You begin by mentioning your efforts “to debunk a lot of the “revealed wisdom” in the SQL Server community.” You also uttered something about Sql-Server DBA’s “love affair” with clustered index keys, and go on to observe that “Oracle DBAs shake their head in amazement.” No offense, but whatever opinion Oracle DBAs have about clustered indexes vs. heaps in Sql-Server databases is not persuasive. With that in the introduction and your picture of someone shooting themselves in the foot next to what really is a fringe case (a clustered index on a NON-sequential column), I suspect that you have sold some inexperienced developers on the idea of converting their clustered tables into heaps. In reading through some of the comments, I’m sure of it. I’m not sure if that was your intent. Yes, there are a few good cases for using heaps, but not very many. The conventional wisdom is correct: Most tables should have a clustered index on something small and sequential (and ideally unique). Its fine if your intent is to point out exceptions to conventional wisdom, but it sounds like you are trying to do more than that. In some of the examples you provided of why a heap would outperform a clustered table, there are other solutions to those problems that do not require converting the table to a heap, which might (and probably would) be better than converting them to a heap. I’ll stick with your example table having a clustered index on a non-sequential column. You showed a query plan having a bookmark lookup and went on to explain why it faster over a heap (because a RIID lookp in a heap is faster than its bookmark lookup counterpart in a clustered table). A much better solution would be to get rid of the bookmark lookup altogether by creating a covering index. In my experience, bookmark lookups are evil. Yeah, sure — the query plan shows an additional 5% cost, but often times when you get rid of it, query performance increases by much, much more. If the clustered index on the non-sequential column is a problem, than put the clustered index on a sequential column (which, in today’s world could even be a guid, since newer versions of Sql-Server provide the option to create them sequentially). If, for one reason or another these things are too impractical in this hypothetical table, then fine, use a heap, but it should be a LAST resort, not a first one. First of all, you need to understand the issue with sequential keys. I have written about this elsewhere. At low scale, sequential keys are nice because they reduce fragmentation – but at high scale they are a terrible idea. In other words: clustered indexes on sequential columns are a TERRIBLE idea and if they are the typical case when you build databases that are meant to scale, you are doing something very wrong. Shooting yourself in the foot really is the right analogy here. Second, covering indexes are very nice and will always be the fastest option if you have enough space and DRAM. However, for large systems, they are impractical in a greatly many cases. Again, you have to understand the difference between performance in small databases and scalability in large systems. When you are building a large system, minimising database size and keeping the index footprint low becomes important – because you want to keep as much of the database in memory as possible. Bloating the tables with covering indexes causes tables to spill out of memory – and at scale, this is a really bad tradeoff compared to a few bookmark lookups. You can do something in the range of a few million bookmark lookups from memory in the time it takes to read a single page into DRAM. For small tables, go ahead and cover them with indexes – but for large tables (where large is defined as “does not fit in DRAM”), you really are shooting yourself in the foot by bloating the table with covering indexes. In summary: I really DO mean that a lot of the conventional wisdom in the SQL Server community is just plan wrong. On that note: I find it rather patronising to your fellow human to assume that “some inexperience developer” will make bad decisions just because he reads a blog entry. In general, I believe that human beings are capable of thinking for themselves, especially when presented with good arguments. Was there any further discussion or pointers to resources for the other “trick” necessary for infinitely scalable inserts beyond the non-clustered GUID approach as mentioned in the section on “Good Reasons to Use a Heap”? I am testing my application with both clustered auto-increment integer keys and non-clustered GUID keys and I’d like to ensure I’m not leaving anything important out. Excellent question – thank you. The bottleneck I am hinting at is the allocation of the next pages in the heap. At a speed of somewhere around 200MB/sec into a single table, you start bumping into a latch that protects the high watermark of the heap. There are a few ways to work around this bottleneck. If you expect the heap to always have seeks on the GUID, you can partition the heap on the GUID itself. Simply chop up the 128B GUID space into, say 16, equally sized chunk and create a partition function that divides the space like that. This way, you will be inserting into multiple heaps (with multiple high watermarks) and spread out the load. If you are expecting more of a scan type workload (typical for data warehouses) you can partition by some hash value you invent for the purpose. In the “Good Reasons to Use a Heap” section, the non-clustered GUID index is described as “a heck of lot more scalable than the last page insert problem (though not infinitely scalable, you need an additional trick for that)”. Did I miss any elaboration on what that additional trick was? I am in the middle of testing the performance of my server application with the non-clustered GUID index approach in place of its current clustered auto-increment approach and I wouldn’t want to miss a component of the approach that affects its scalability. Thanks for your posts. I’ve learned a ton from them. is probably 10 reads for every one write. I've spent the last few weeks learning SQL server tuning on the fly.. I write a lot of sql, but normally I'm a C# app guy. I've had the gut feeling all along that both the framework vendor and the consultants who did the initial implementation made a massive mess of the DB based on 'conventional' wisdom. Our DBAs and system 'Architect' have scoffed at my suggestions all along that we should try turning many tables into HEAPs, spouting 'Without the VENDOR suggesting it? Are you crazy?". While it's been a complicated tune (for me at least) and I've greatly oversimplified the problem in this post, your ideas laid out here, Thomas, helped me improve overall performance of our system by %300 on average. P.S. I AM an american, and share your cynicism deeply on the state of our society. The mid-size corporation I work for is the mess it is EXACTLY because people are lazy and cannot be asked to THINK for themselves.. the path of least resistance really is the american way, on average. TLDR: This topic helped me think outside of the box and solve a massive problem, both in critical spirit, and technical detail. Thank you, sir. Your site here is instantly a favorite bookmark for me. Thank you for the kind words. I am really happy to hear that my advise was useful to you. I am also happy to see (As I also mentioned) that the US still have great people like yourself who dare to challenge conventional “wisdom”. It’s such a shame that the political system has created an environment where complacency and political correctness overrules good reason. The KB is old, but it seems plausible that “searching heaps for freespace” could still be bottleneck, since the core architecture of heaps hasn’t changed since SQL 2000. Is this something that you’ve seen in your high-transaction environments? If so, what have you done to mitigate? Umm, okay, wow. Sounds like it’s time for me to gracefully step out. Thanks for the conversation, guys! Sorry Brent, I didn’t mean to single out any individual. You must admit that living in a country where a large portion of the population believes the earth is 4000 years old, watch Fox news, think themselves to be informed and then go on to vote republication isn’t exactly something to be proud of. The signs of endemic stupidity can’t be much strong than that. I appreciate that not everyone is like that and that intelligent people suffer under it. But I am sure you can appreciate the irony: that my point about the dangers of catering to the lowest common denominator is particularly well illustrated by the current state of the US. Note the popularity of blogs like SQLauthority.com where they give a very tightly focused answer to a simple question, and they’re massively, massively more popular than Thomas and I combined. I’m certainly not saying Thomas needs to be more like Pinal, nor am I saying Pinal needs to be more like Thomas. There’s a middle ground there, though, where we can boil down complex topics into guidelines for time-pressed readers, then give more information for folks who would like to pursue the topics deeper. Oh god, don’t start with SqlAuthority. The solutions there are often out-dated and based on superstitiousness. I think there is a category mistake going on here. Just because something is popular or widespread does not make it RIGHT or worthy of pursuit. No matter how many people believe silly things, they remain silly things. Personally, I find it deeply insulting when people speak to me like a child because there happens to be an ignorant audience out there. I don’t question that there are stupid people in the world. There are people who blindly copy/paste code, shoot themselves in the foot while blaming others and then go on to ask stupid questions. But the moment we cater to them and lower our standards for communication, we are guilty of taking something good out of the world. Boring, long sessions with very little content. …With tons of time wasting disclaimers at the beginning. Thick, boring books full of screenshots that describe all the internals of SQL Server, but fail to mention the central methods required to actually do root cause analysis on complex problems (compare with the MySQL community and the complete focus on solving problems there). Dumbed down default configuration settings that are the lowest common denominator. A silly fear of trace flags that might do people good if they were to know them. PSS articles where you have to read so many disclaimers that when you finally arrive the facts, you are likely to need another cup of coffee just stay awake long enough to understand them. If I was on a mission to publish small, frequent articles like that – I would have chosen a HOWTO database. Then people can publicly contribute and the bite size information would be easier to search. Thomas – uh oh, we’ve got a problem here, and it doesn’t have anything to do with the always-excellent quality of your research. The problem is the phrases “big” and “scalable”. Over and over again, when customers come to me and I ask about the size of their data, they always – ALWAYS – say it’s big. After all, it’s the biggest data *they’ve* ever seen. Ideally, if you’re doing your career right, you’re always moving upwards and onwards to bigger and faster systems, but that always means you’re working with what you *think* is “big”. In reality, most of these databases are 50, 100, 250GB. That’s how we end up with a lot of really small databases designing themselves for really big scale. Could you do me a huge favor? In the post somewhere, not in the comments, can you define what you mean by the terms big and scalable? That’ll really help in the years to come as I get folks saying all their 5GB tables are heaps because Thomas Kejser told them it was the right way. Thanks, and keep up the great work! I was worried that you’d be retiring from all SQL Server life, heh. Yes, we do indeed have a problem here. The problem is that people think that having IDENTITY column on a clustered index is generally a good design choice and that Heap+GUID is a horrible idea – and that is simply not true. I don’t really care if your data is 5GB or 5TB – If you are paying a few extra IOPS (and note, you dont HAVE to, there are way to still get good page filling) to get something that can grow, you are IMHO doing your job as a DBA (which business does NOT want scale?). Fragmentation and page splittings are a distraction (and are inevitable) and they take focus away from doing the real work of actually tuning the queries and indexes. As you will also notice in the blog post, I explicitly list the times where it DOES make sense to use a clustered index. The problem is that this “Best practice” has been taken too far and that people now blindly apply the cluster on IDENTITY advise – which is a sure fire way to get them into trouble that (unlike page fragmentation) they cant easily get out of by throwing more hardware at the problem. So no, I am not going to update the post with such a qualification. I am of the opinion that people need to think for themselves and understand the real trade-offs. Qualifying all advise with “this only applies if you are bigger than X” is IMHO a sure fire way to speak to SQL Server DBA as if they were children (and it also addressed them as if they only have small databases). Give people the facts and have them think – that is the respectful thing to do. Thanks for the kind words though. Though I am working with both MySQL and MSSQL these days, I will be blogging about both. Ah, see, I would agree if everyone had the time to “think for themselves”, but when folks are under the gun to design and build lots of database applications quickly, they often need to start with guidelines, and understand when to deviate from those guidelines. Think about the thousands of developers working right now to build an app. Do they have time to understand database structures fully before they build a table? I wish they did – but I remember back to my job ten years ago, and I didn’t. I just needed a quick guiding rule – when I’ve got databases under X GB, what’s the safest way to get started that won’t kill me? I agree that we are all under pressure (though I think it is a little condescending to assume this means people don’t think). So, if you are really under pressure to get something out the door – I would claim that your best choice is to use GUID. They are a ton easier to program for (you can generate them in the app and not have to learn about the ins and outs of SCOPE_IDENTITY(). And with GUID, you don’t run into any nasty surprises if you suddenly grow the data. Now, you can do BETTER than GUID (and gain most of the benefits of IDENTITY) if you have time to think about it. For example using bit reversed sequencers (see the link to Rick’s Blog: http://dangerousdba.blogspot.co.uk/2011/10/day-sequences-saved-world.html) – but that is still not IDENTITY. To summarise: If you dont want to think, use GUID – because that is future safe when the fools up in management want to throw hardware at the problem. I don’t think the evidence supports IDENTITY columns as good choices. Saving a few bytes on the rows and avoiding page splits really shouldn’t be the priority if you are under the gun, building a proper database and indexes should be. As I am also stating in many of my posts: If you are working on some super shared virtual with 2 cores, memory over allocated a crap SAN underneath – you are already a lost cause. Thinking about GUID/IDENTITY shouldn’t be your concern, creating fully indexed paths to the data should be (and filling out your CV would be another good idea). Brent, I find it very tribal to think that a reader of this blog post who manages to finish reading it will actually blindly follow the instructions without further curiosity and testing. As we discussed in private a while back, there are two types of SQL Server gurus: the ones that bring 300 sheets of printed paper and makes 101 level presentations around them, and the ones that push the boundaries of the SQL Server product features. (awards and audience statistics are merely food for the poor ego and are matter of interpretation). I don’t really understand the problem you are having with the blog post: are you worried that you will get swamped with extra consulting work if people implement heaps after reading the blog post, or are you afraid that you will have to do some heavy lifting and test the suggested approach from different angles? Trust me, there are a lot of humble and quiet people out there who read blog posts like this one and take it to the next level without being in anyone’s face. In general, doubting the qualities of the reader will make you less popular. Feodor – about “actually blindly follow the instructions” – I’ve got a great story there. When I first published my original Blitz script (before it was a stored procedure), it was an interactive script that you would run line-by-line, reviewing the results. I put in big capital letters across the top, READ THIS AND RUN EACH BATCH SEPARATELY. There were variables that you needed to enter at various stages – for example, your email address was used to test database mail. The default value for that variable was my own email address. I got dozens of emails per day. People just copy scripts from the Internet, don’t even read them, and run them on their own production servers. You’re different – you would never do anything like that, because you’re exactly the kind of reader Thomas wants. You put a lot of thought into the advice you get, and you carefully evaluate things before you put them into production. It’s GREAT that you’re different. I wish every reader was more like you. But doubting the qualities of the reader doesn’t make me more popular – and in fact, it’s quite the reverse. Hope that helps explain where I’m coming from. Thanks for taking the time to share your thoughts! Set up an template mail that says: RTFM! with a link to the instructions. And I must say that the heated Stack Overflow discussion was just caused by different people having different opinions on what a “common situation” and “assumptions commonly true” are. Depending on where a DBA comes from he will have different priorities. I have been in such discussions. Everyone loses. Such a situation can be 100% defused by giving a complete and unbiased list of advantages and disadvantages of each alternative. Tobi: My goal of this post was indeed to provide such an unbiased list of pros/cons. I think the bias has been too heavy on the CLUSTER/IDENTITY school – to the extend that it is touted as religion. Another advantage for heaps is that they get allocation-order scans (IAM scans). For a b-tree this only happens under nolock or tablock locking models. Another disadvantage for the heap+unique nci strategy is that it uses more disk space. The nci is redundant. One row will take 16(guid)+8(bookmark)+9(row overhead) space. That’s an increase in effective row size of 33 bytes right there. Good comments Tobi. However, you last calculation is not what actually happens in most situation (which is why I only use heaps in the fragmentation prone situation). For quite a while (ever since a month after I got introduced to SQL Server) I have been wondering why the PK get Clustered by default and what is the link between one and the other. Even in smaller tables in OLTPs I have seen huge performance problems with this. At one time i git 100 times performance improvement by moving the clustered index from a PK to the FK, since the table was actually joined on the FK and the query was running about 100 times per second. This post has been on my mind for a while now, but I don’t think I would have written it better than you. Great job!